"Tis' the season to be breaking records! 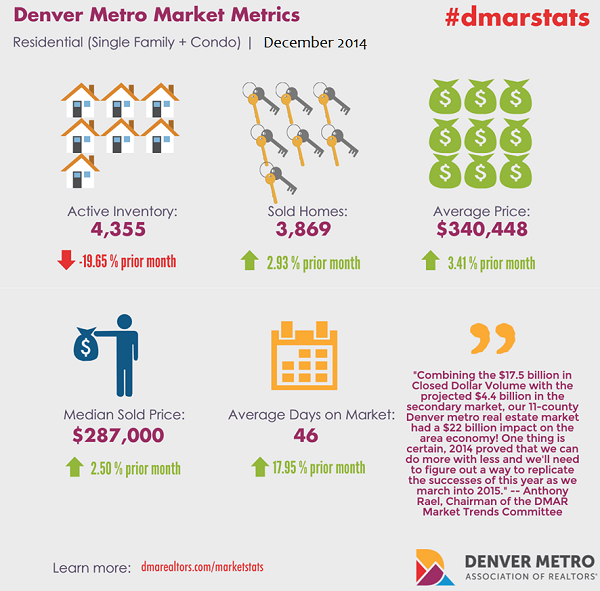 While inventory throughout the 11-county metro Denver area continued to be naughty, the number of sold listings, average sales price and sales dollar volume were all very nice. 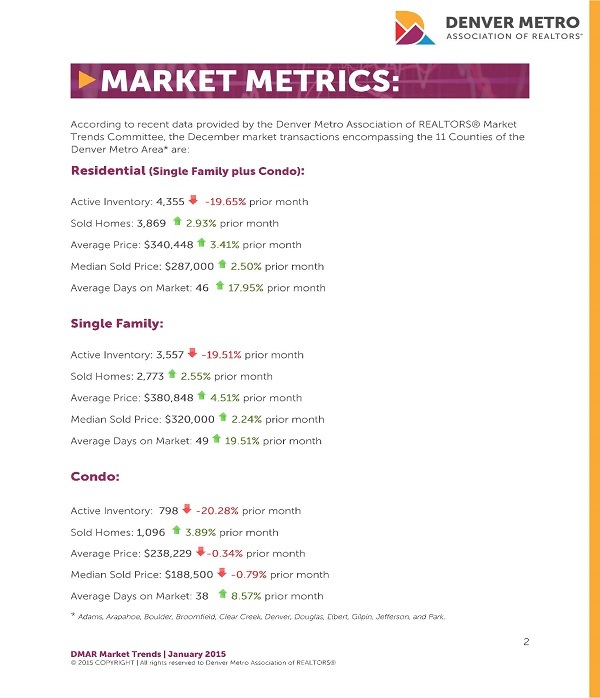 Active listings for single family and condos decreased nearly 20% from the previous month to an annual low of 4,355 units in December. At December month end, there was less than a 500-unit difference between the number of active listings (4,355) and the number of sold/closed (3,869). 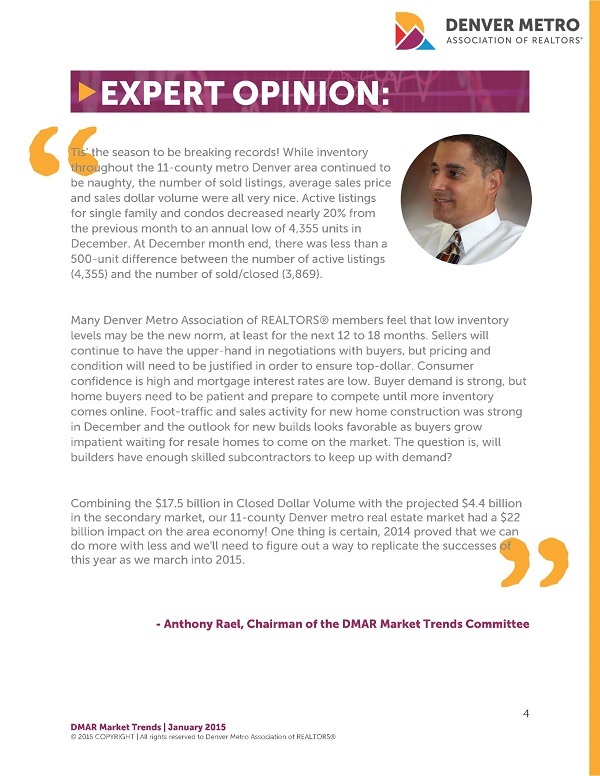 Many Denver Metro Association of REALTORS® members feel that low inventory levels may be the new norm, at least for the next 12 to 18 months. Sellers will continue to have the upper-hand in negotiations with buyers, but pricing and condition will need to be justified in order to ensure top-dollar. Consumer confidence is high and mortgage interest rates are low. Buyer demand is strong, but home buyers need to be patient and prepare to compete until more inventory comes online. Foot-traffic and sales activity for new home construction was strong in December and the outlook for new builds looks favorable as buyers grow impatient waiting for resale homes to come on the market. The question is, will builders have enough skilled subcontractors to keep up with demand? 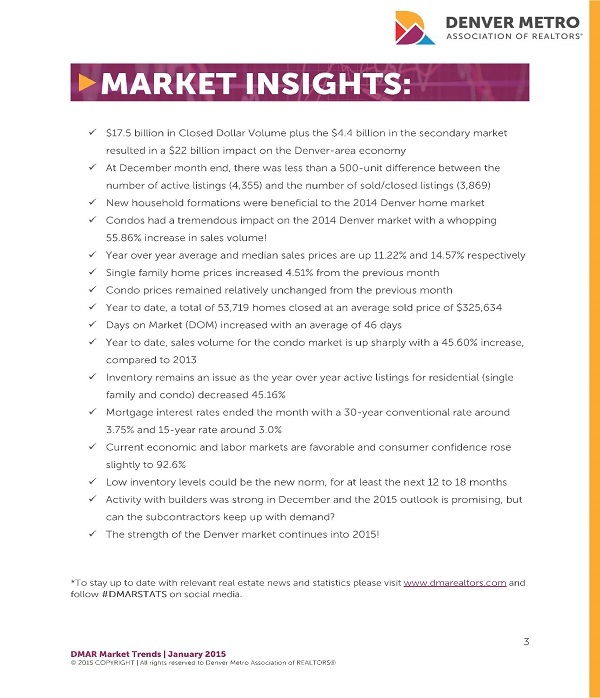 Combining the $17.5 billion in Closed Dollar Volume with the projected $4.4 billion in the secondary market, our 11-county Denver metro real estate market had a $22 billion impact on the area economy! One thing is certain, 2014 proved that we can do more with less and we'll need to figure out a way to replicate the successes of this year as we march into 2015."